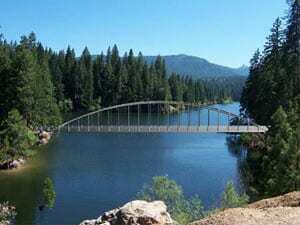 Engineer’s concept for a pedestrian bridge over Wagon Creek on the Lake Siskiyou trail. 1. Continue to fulfill our mission by designing, constructing, maintaining and using trails in the Mt. Shasta region. Utilizing the 2013 Conceptual Trails Plan, seek funding to build 100 miles of new trail over the next 10 years. Work with Siskiyou County to complete the Lake Siskiyou Trail from the beach to the marina and along the chalets. Maintain what we’ve built: Box Canyon, Cabin Creek, Gateway, Elsa Rupp, and Spring Hill. Continue to make progress on a paved City Park to Downtown trail. Identify new trail projects with a focus on urban trails (Long Term). 2. Strengthen Board of Directors and organization operations. 3. Increase MSTA membership and member loyalty through enhanced communication, combinations of fun and work activities and member recruiting programs. 4. Develop alliances with partner organizations. Work with the following groups on a variety of projects: BikeShasta, Rotary, Mountain Wheelers, Mountain Runners, Nature Conservancy, Pacific Crest Trail Association, Siskiyou Land Trust, Siskiyou Meanderers, Siskiyou Wanderers, Cal Trout,and the River Exchange, Volcanic Legacy Scenic Byway Partners, and the Great Shasta Rail Trail Association. (On-going).